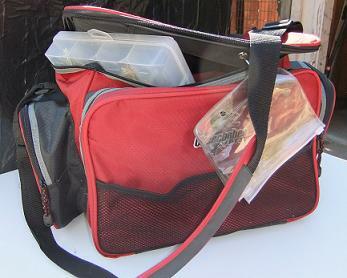 Fishing tackle bags might be just what you could be looking for. Soft sided tackle bags provide better comfort for carrying around, nice organization, and the ease of accessibility. We have gone through review after review, and selected the top 10 selling tackle bags according to consumer satisfaction ratings. Please note that some of these fishing tackle bags listed below may also come in a variety of colors to choose from, and the prices may vary accordingly per color selection. So you could have the option to choose from black, red, blue, green, gray and even pink. 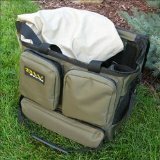 Most tackle fishing bags manufactured nowadays have the traditional hand grip strap that also include a shoulder strap. A shoulder strap allows for you to have an extra free hand for other things that you may need. Tackle bags are soft, rather than the hard plastic, or even the bulky heavy wood and the heavy metal tackle boxes from back in the day. Therefore, they don't bother you as much when they are bumping up against your body as you maneuver around. They are great for travel, camping, hiking, biking, bank fishing, fishing on a boat, using as a co-angler, and much more. Some of the best freshwater fishing tackle bags are water resistant, light weight, have various storage pockets, include multiple stowable utility boxes, and able to carry all of the necessary fishing gear that you should need for any freshwater fishing trip. There isn't much negativity to report about having a tackle bag. Of course a tackle bag isn't going to be suitable for every angler. It's really up to the angler to determine what is the most comfortable to themselves.